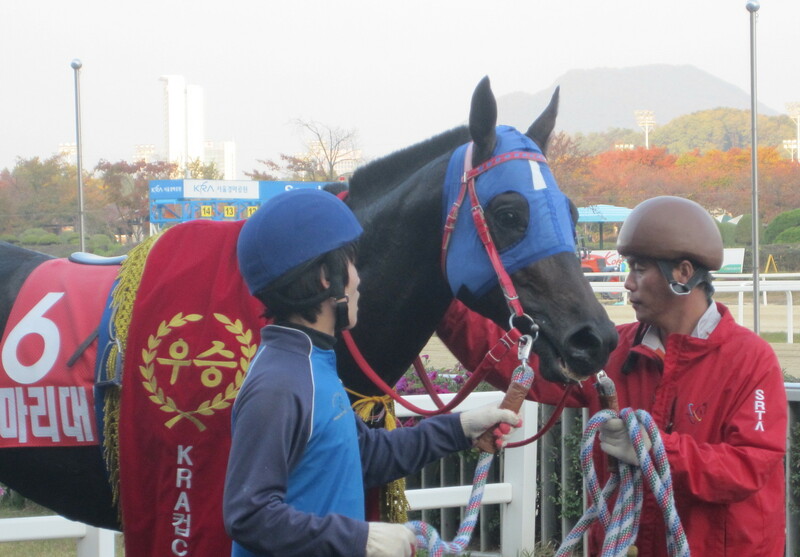 Three Korean-trained horses will fly to Japan on Friday to take part in the Interaction Cup at Ohi on November 11. However, the winner of last year’s race won’t be among them. Instead Watts Village will be at home in Seoul this Sunday, taking on some of the track’s best known imports in the weekend’s feature event. Chief among eleven rivals for Watts Village is Wonder Bolt. The 4-year-old came the closest to El Padrino in the Asia Challenge Cup at the end of the August. And while the Singapore raider claimed the track record that day, Wonder Bolt was also comfortably within the previous best mark. The race will be run over 1700M and going around two-turns for only the 2nd time will be Fly Top Queen, still the nation’s most expensive racehorse. She was an also ran in both last year’s Interaction Cup in Tokyo and in the Asia Challenge Cup as well as finding herself beaten by both Wonder Bolt and Watts Village back in July. A return to form is overdue. Watts Village himself returned to form at the beginning of October with a crushing win over, among others, Here He Comes and Parang Juuibo, both of whom will be on the flight tomorrow. While we wish them the best of luck in the Japanese capital, there will be those lamenting that the three who run in the Korean capital on Sunday opted against taking their chance. Pinot Noir produced a late run to upset hot favourite Cheonnyeon Dongan to win the Gyeonggi Governor’s Cup at Seoul Racecourse on Sunday and in doing so, be crowned the capital’s Champion filly or mare of 2014. Cheonnyeon Dongan was a proven winner at class and distance against colts. Pinot Noir on the other hand, was running in class 1 company for the first time after winning the Horse Racing Ireland Trophy in August and then running a creditable third in the Donga Ilbo Trophy last month. And it was the favourite, always travelling well under Seo Seung Un, who looked to be in the box seat she hit the front as the field entered the home straight at the end of the 10 furlong race. However, Park Hyun Woo on Pinot Noir had other ideas, shifting his filly to the rail and making up ground rapidly. The two would battle it out in the final furlong and it was the 12/1 chance Pinot Noir who just had her neck in front as they hit the line. 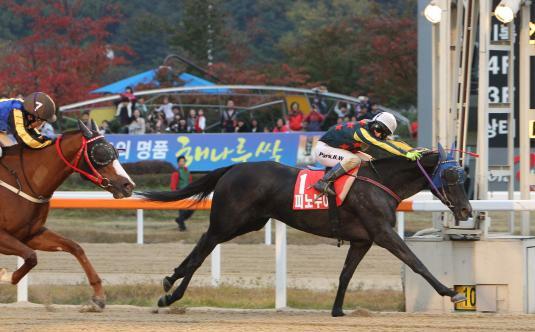 Choichoro, a 10/1 chance ridden by Moon Se Young came home in third place, 4 lengths behind the leading pair. 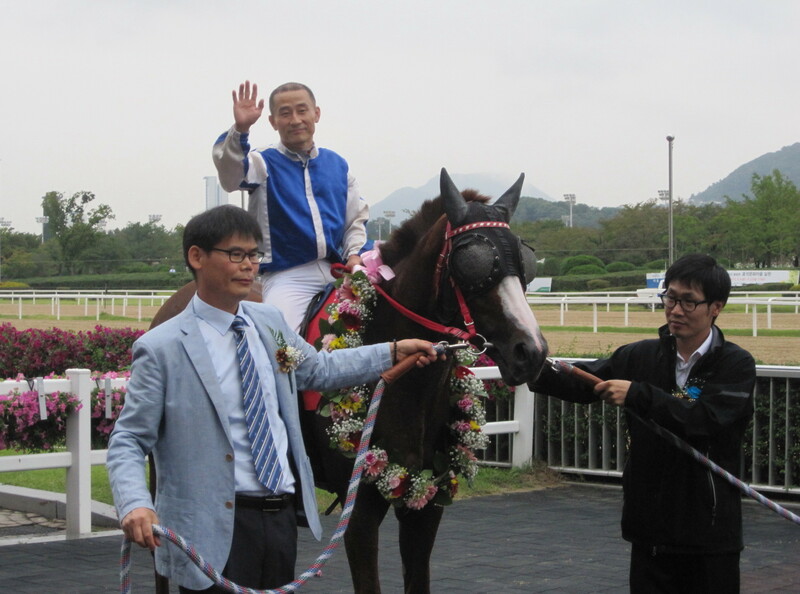 It was a 5th win in 15 starts for the 4-year-old Pinot Noir and the first really big win for jockey Park Hyun Woo. * Cheonnyeon Dongan wasn’t the only favourite to go down at the weekend. Saturday at Seoul saw a number of odds-on shots turned over, principal among them the highly rated Power City (Archer City Slew) who was beaten in the final strides of race 10 by Jeil Jal Naga (Dice Dancer), a horse he had beaten by 9-lengths just a month ago. Also losing (again) was Call Me Rocket (Colonel John) who finished last in Saturday’s race 11 which was won by 25/1 Wahaha under a very good ride by Lee Ah Na. And in Saturday’s final race 12, Foolish Scip (Scipion) finished 2nd for the 5th consecutive race, this time losing out to up-and-coming import Clean Up Joy (Purge). Favourites had a slightly better time of things at Busan where the feature race was, unusually, on Friday. Nobody Catch Me (With Distinction), the shock winner of July’s Busan Metropolitan City Stakes made his first start since his victory that day and indeed, nobody could catch him as he cruised to a 5-length win over veteran Viva Ace (Macho Uno) in the 1900M class 1 event. There’s no Stakes action next weekend but we are now less than two weeks away from Korea’s richest race, the President’s Cup, which will be run at Seoul on Sunday November 9. 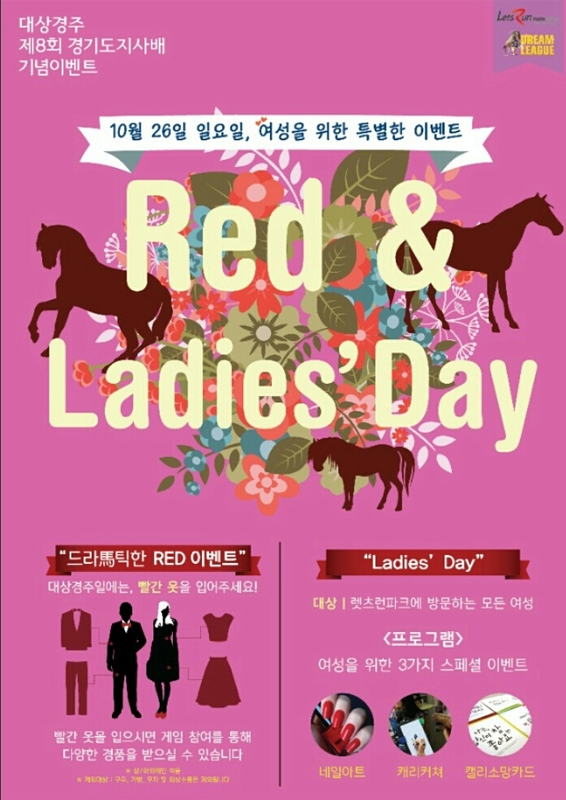 It’s Ladies’ Day at Seoul Racecourse this Sunday. 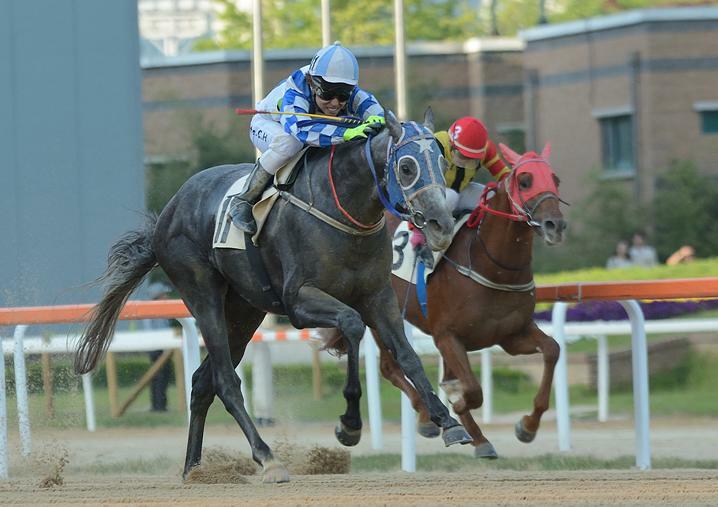 The capital’s champion filly or mare will be decided in the Gyeonggi Governor’s Cup. And while punters are encouraged to wear red, the race will be one of the first opportunities for them to try out Korean racing’s new “rating” system. For many years, Korean racing has been divided into 6 classes (5 at Busan due to there being fewer horses there) with horses receiving a fixed number of points for winning and placing and moving up the classes. There is no facility to move back down in class. Under the new system, all races will be reviewed and a horse assigned a new rating after it – if it is low they can go back down in class (more on that and its implications over the next couple of weeks). The new system has started this month for horses in the existing class 1 only with a base rating for the top-level of 100. This Sunday, the Gyeonggi Governor’s Cup – a Korean Group 3 race for Korean-bred fillies and mares – is one such race that has a rating for all entrants. However, to be honest, there isn’t a whole lot to choose between them! So there you have it, the ratings say Cheonnyeon Dongan wins this one. And really, she should. The year just keeps on getting better for Ikuyasu Kurakane. 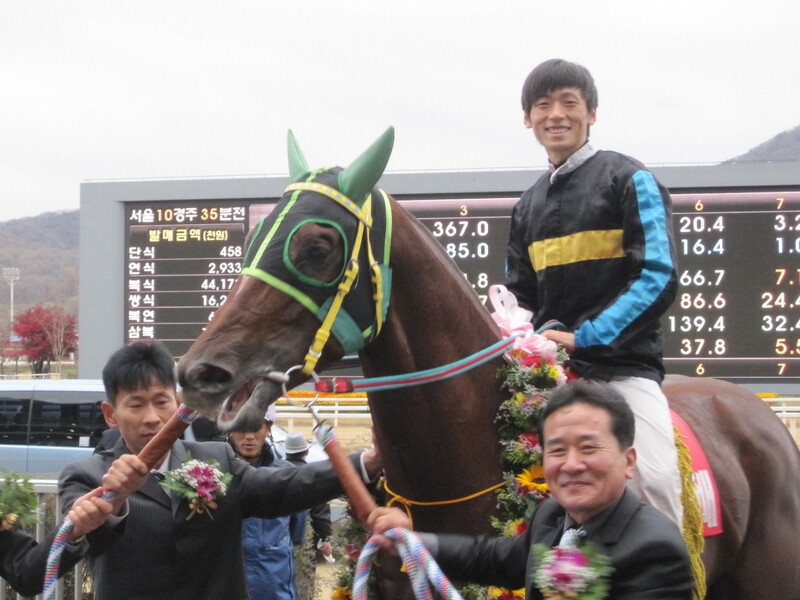 The Japanese rider, who is 2nd in the Jockey Championship, got his first Group win or his second stint in Korea by riding Samjeong Jewang to the narrowest of victories in the KRA Cup Classic at Seoul Racecourse on Sunday. Indian Blue, who Kurakane has had success on in the past, was sent off as the odds on favourite, but despite a change in tactics from jockey Moon Se Young, the filly still found herself left with too much ground to make up in the final furlong. Instead, it was Samjeong Jewang who beat out a determined challenge by outsider Rush Forth and filly My Day to win by a nse on the line. Indian Blue came hom in 4th but last year’s winner Mari Daemul could only manage 10th. 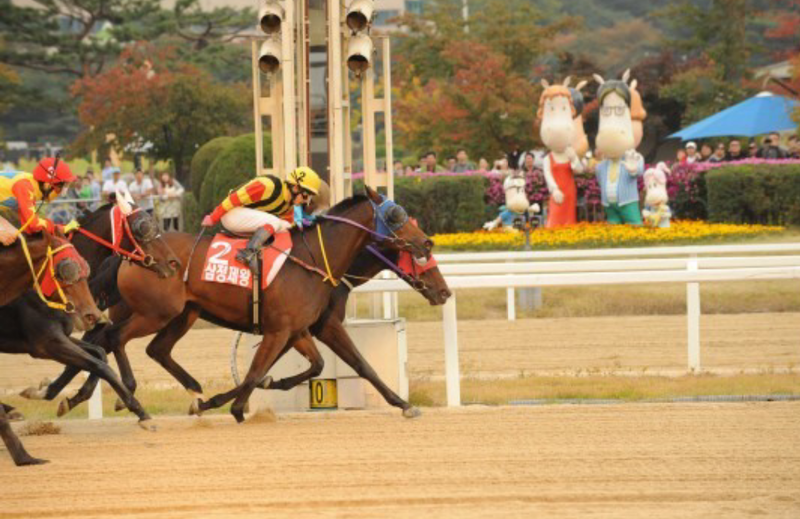 Samjeong Jewang moves on to six wins from nine career starts and a possible run for the Grand Prix Stakes in December. Mari Daemul heads the field this coming Sunday at Seoul Racecourse as he attempts to successfully defend the Group 3 KRA Cup Classic that he won here a year ago. Decent horse who hasn’t finished higher than 4th this year. Probably won’t be getting a whole lot of income out of this race. Comes into the race off the back of three consecutive wins, including at this class and distance last time out. He beat Indian Blue in that race and while he doesn’t have the same weight advantage here, he ahs every chance of doing it again. Not the most appropriate name for this one but he does usually finish in the money at least. Has a chance of doing so again but will probably find one or two too quick among this field. Takes his chance after finishing 2nd of 7 in a slowly run race over 1900M last time out. Should get a good position but others will be quicker in the final furlong. This one was a really promising 3-year-old but has struggled since making it up to class 1 and is unplaced in three starts since returning from a layoff in June. Will most likely be unplaced again. Another who has the ability to go close without being likely to actually win. Fourth behind Samjeong Jewang and Indian Blue last time out, that seems a reasonable ambition again here. Three of his six wins have come at class 1 and he comes in after two consecutive triumphs. Likely to be among the frontrunners and with good closing speed, he is not without a chance. A first try at class 1 for this 3-year-old. He’s never been out of the money in his nine starts to date and has good late speed. May meet his match in his couple of these but shouldn’t be too far away. It really is a travesty that Indian Blue has only won 5 of her 20 races. One of the quickest closers in Korea – and the quickest in this race – she does have a habit of finding just a little bit too much to do. Second place should be a minimum requirement. The defending champion hasn’t been seen on the track since finishing a disappointing 9th in the Busan Metropolitan in July. His last run at Seoul ended in success though and while he may not be the favourite, he has a chance of successfully defending his title. Steps up in class and in distance after two consecutive wins at class 2. Likely to be among the front-runners and he is quick, but this field is much superior to anything he has faced before.